■ Cooling capacity is measured under working conditions where the temperature of inlet air dry/wet bulb is 27°C/19.5°C and the temperature of inlet/outlet water is 7°C/12°C. 60°C, and the water flow is equal to that for cooling operation. ■ Rated air flow is measured under standard atmosphere using dry coils (the temperature of dry bulb is 20°C). ■ Sound pressure grade and noise level are measured in a semi-silent room as per GB/T 19232-2003. ■ Sleep mode: In auto control mode, the unit can use the control logic to determine whether to enter the sleep mode based on the real-time load of the room. ■ H, M, and L indicate high, medium, and low fan speed respectively. ■ Static pressure refers to the outlet static pressure of the unit. ■ All performance parameters in the preceding table are measured with a power supply of 220V~/50Hz. ■ The left/right orientation of connection pipes is exchangeable on site (cooling/heating capacity needs to be multiplied by a correction factor of 0.93 after exchange). ■ Cooling capacity (chilled water coil) is measured under working conditions where the temperature of inlet air dry/wet bulb is 27°C/19.5°C and the temperature of inlet/outlet water is 7°C/12°C. ■ Heating capacity (chilled water coil) is measured under working conditions where the temperature of inlet air dry bulb is 21°C, the temperature of inlet water is 60°C, and the water flow is equal to that for cooling operation. ■ Heating capacity  (hot water coil) is measured under working conditions where the temperature of inlet air dry bulb is 21°C, the temperature of inlet water is 60°C, and the temperature of outlet water is 50°C. ■ Heating capacity  (hot water coil) is measured under working conditions where the temperature of inlet air dry bulb is 21°C, the temperature of inlet water is 82.2°C, and the temperature of outlet water is 60°C. EKCW series brushless DC fan coils use the latest patented brushless DC technologies developed jointly by EUROKLIMAT (EK) and China Aerospace Science & Industry Corp (CASIC) and the leading-edge air processing technologies to implement stepless speed regulation. These fan coils can automatically regulate the rotation speed of motors based on the indoor load variation to maximize energy saving (saving energy by more than 65% compared with common fan coil systems). More than 300 models in the full series of units are available for customers. The unit is designed and manufactured to work withEK's efficient heat exchangers. Compared with the fan coil of a traditional AC motor, the unit saves energy by more than 65% as a whole, reducing the energy consumption for the entire HVAC system by 14%–18%. The unit saves energy by 20%–35% at the nominal high speed, by 45%–65% at the nominal medium speed, and by 65%–85% at the nominal low speed. 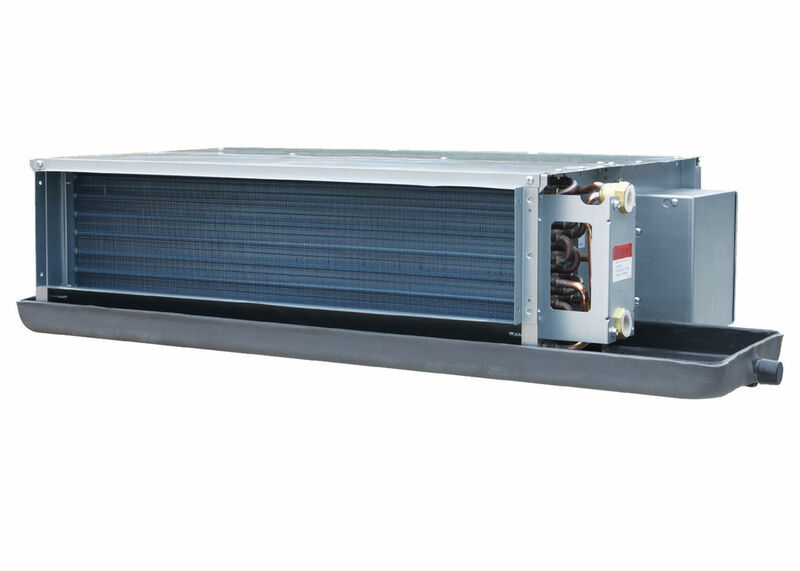 Generally, a fan coil reaches the set temperature within one hour after power-on, and then runs at a low or medium speed. Objective calculation shows that EKCW series brushless DC fan coils save energy by 65% compared with traditional fan coils. Due to a major difference between the indoor temperature and the set temperature in the initial phase of power-on, the powerful cooling/heating function of the unit can regulate the indoor temperature to the set one within a short period and control the air flow based on the actual load of the room, saving energy and generating less noise. Due to a low temperature control precision (±2°C), traditional fan coils usually require a set temperature of 20°C–22°C to prevent unpredictable temperature changes in hot summer. Due to a high temperature control precision ((±0.5°C), EKCW brushless DC fan coils allow a set temperature of 26°C (comfortable temperature). EKCW brushless DC fan coils can perform proportion integration (PI) calculation based on the variation between the indoor temperature and the set temperature. These fan coils can intelligently adjust the rotation speed and air supply volume of motors within a wide range, and provide a temperature control precision of ±0.5°C, creating real and comfortable indoor environment with constant temperature. EKCW brushless DC fan coils feature the unique sleep mode, in which the lowest noise level is only 18 dB(A), creating comfortable indoor environment with constant temperature for customers and providing a fresh and comfortable 3-D sleep space. cooling, strong heating, strong dehumidification, timing setting, fire alarm, automatic temperature control in standby mode, 2-way/3-way valve protection, and network-based control (RS485). Optional accessories: PTC electric heater, UV+photocatalyst for sterilization, condensate water lifting pump, and anti-blocking float switch. Traditional fan coils adapt to only one outlet static pressure. If the on-site static pressure is improper, the motor must be replaced. EKCW series brushless DC fan coils can adapt to the outlet static pressure of 0–50 Pa. The outlet static pressure can be directly adjusted on site based on temperature controller settings without replacing the motor. The unit uses a forward-pitched multi-wing centrifugal fan with double-suction impellers made from zinc-plated steel plates, featuring low noise, high wind speed, and smooth operation, and achieving the best result of air supply. All coils use shutter-type hyperbolic and hydrophilic fins made from mechanically expanded quality copper tubes specially designed for air conditioners. All coils are subject to leakage-free test under a pressure of 3.3 MPa, and are strictly inspected before they leave the factory, ensuring high performance and reliability. The unit uses a condensate water collector that is molded as a whole, and features enhanced heat preservationfor the water collector and innovative batter drainage structure, effectively eliminating generation and dripping of condensation. The unit features a rational air flow design for air supply and return so that air is evenly supplied to all corners of the room, making the room feel comfortable. The unit uses sterilization technologies of nano-TiO2 photocatalyst to achieve a sterilization rate of 95%, considerably improving the air quality for work and life. The unit features the single-area controlled design, and therefore can match the master unit of any central air conditioning systems with centralized cooling/heating. With a compact, graceful, and robust design, the super-thin (only 230 mm thick) unit can be easily installed. The unit uses industry-leading water system control technologies and temperature control technologies to save energy during system operation. The unit does not generate high-frequency harmonic and electromagnetic interference during stepless regulation.Therefore, the unit can be widely used in places with strict anti-interference requirements for power supply, including computer rooms, telecom base stations, TV and broadcast receiving stations, and communication equipment rooms. Office, Hotel , Hospital ,Supermarket ,Airport , Factory ,Villa . Constant Temperature and Comfort The precision of silent temperature control reaches ±0.5°C. Fast Cooling/Heating The speed increases by 30%.